I love this bowl and tried for years to find more of the pattern, but have never found an exact match. 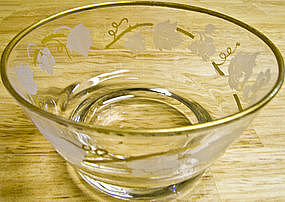 It is Libbey marked and has a gold trim on the rim and the vine is gold as well. I always thought it was a berry bowl because it holds 6 ounces, but could be considered a sherbet dish. There is minor wear. I need your zip code to calculate the postage.